PAHOA, Hawaii (AP) — The number of homes destroyed by Hawaii's Kilauea volcano jumped to 26 on Sunday as scientists reported lava spewing more than 200 feet (61 meters) into the air. 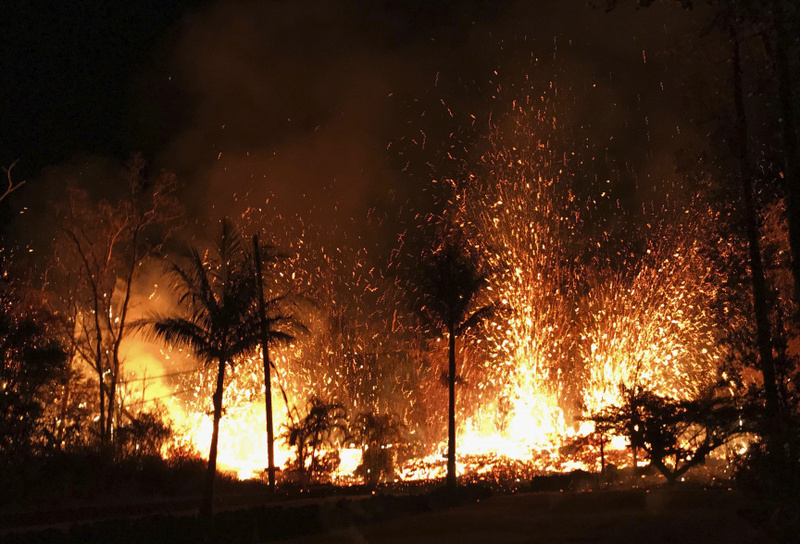 In revised figures, Hawaii County officials said another four unspecified structures were covered by lava. "That number could change," Hawaii County spokeswoman Janet Snyder said. "This is heartbreaking." "They don't really understand," she said about her children. "My son keeps asking me, 'Mommy when are we going to go home?'" "You have to ask Pele," Steve Clapper said when asked whether he had any idea when he'd return to his Leilani Estates home. Clapper had to put his ailing 88-year-old mother into a car and leave shortly after hearing an ominous rumbling behind the house. He believes he saw its roof still standing in photos of the area but can't be sure. Still, the California native was sanguine as he assessed his situation. "What can you do? You have no control over it," Clapper said as he started his day at a nearby evacuation shelter. "Pele's the boss, you know." Kilauea (pronounced kill-ah-WAY'-ah), one of the world's most active volcanoes, has been erupting continuously since 1983. The USGS's Hawaiian Volcano Observatory issued a notice in mid-April that there were signs of pressure building in underground magma, and a new vent could form on the cone or along what's known as the East Rift Zone. Leilani Estates sits along the zone . The crater floor began to collapse Monday, triggering earthquakes and pushing lava into new underground chambers that carried it toward Leilani Estates and nearby communities. A magnitude-6.9 earthquake — Hawaii's largest in more than 40 years — hit the area Friday. It set Michael McGuire's car rocking in his driveway, knocking things off his shelves and shattering glass in his cabinets in an area near Leilani Estates.